Many of our close fans know that I was raised in Montana where we had one music station that was NOT country. It's impossible to grow up in an environment where the top three choices of music are 1) country 2) western 3) country-western and not tap your toes to the beat once in a while. 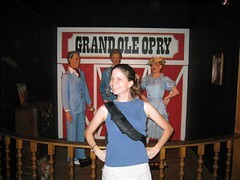 Nashville is a hotbed for country music and the Grand Ole Opry is the core. Concerts are performed every weekend year-round and also on some select weekdays during the summer. Although we didn't catch a show (which would have blown our carefully planned budget), we took in the free "Grand Ole Opry Museum" which was a noble collection of country music related items. From the fringed shirts and boots to the worn guitars, this museum provided a nice tour through the history of the Opry and the country greats that were produced. 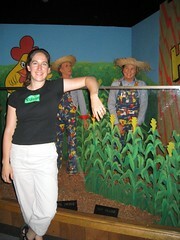 Nearby, a wax museum with a nominal entry fee was irresistible to the 'Chix. This is no Madame Tussaud's, as some of the figurines looked a bit dusty and moth eaten, but that probably covered up the fact that they bore relatively little resemblance to those they were modeled after. Perhaps the best music experience in Nashville came from our own KOA campground (conveniently located right down the road from the Grand Ole Opry). Each night there was an hour of live bluegrass music on the grounds. The band was excellent and put us right in the spirit for our tours in Nashville.